• Last night, I had an incredibly vivid dream that I gave birth to a cat. Well, a kitten, actually - and it scampered under the hospital bed and someone had to trap it and hand it to me to nurse. 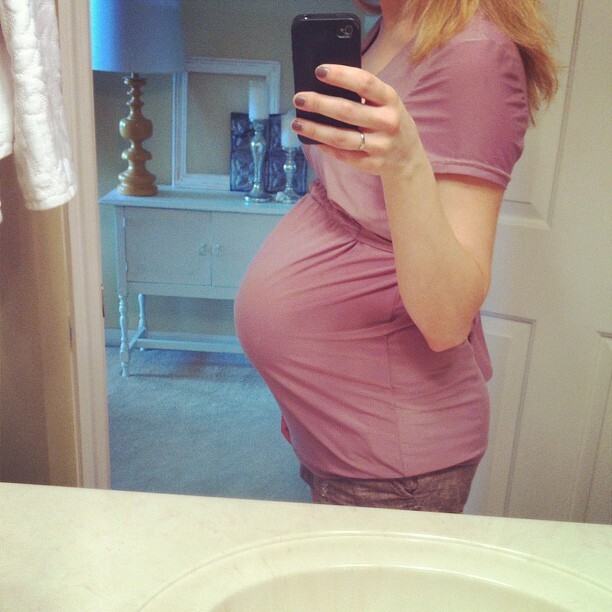 Pregnancy dreams can be a strange, strange thing. • We're off to Atlanta for the weekend! We're seeing friends, training someone to do some sewing for Brighter Day (hallelujah! ), and then spending a couple days by the lake. Cannot wait. • Thanks for the jalapeño suggestions! I tripled Pioneer Woman's restaurant salsa recipe (which is SO yummy) and it made enough for an army. I'll be trying some of your other suggestions soon. They look delicious! god is growing baby e how he is supposed to be, only 9-11 weeks left, right? Keep up the good work! Whitney, I am a long time reader of your blog but this is my first time commenting. When I was pregnant with my 2mo old baby boy, I had so many breastfeeding anxiety dreams including one where I was breastfeeding a kitten! Pregnancy dreams are WILD. (Also, as a Nashville girl currently living on the west coast, I really love all your photos of Franklin!) Thanks for sharing. You look wonderful - I love your nail polish color! So sweet! <3 Glad to hear you liked the salsa--I'll have to try that recipe sometime. And congrats on the help with Brighter Day--that will be a huge blessing for sure! !